The exterior of the Commercial Hotel in February, 2012. It is only a matter of time before the building will boast a new exterior say the owners. 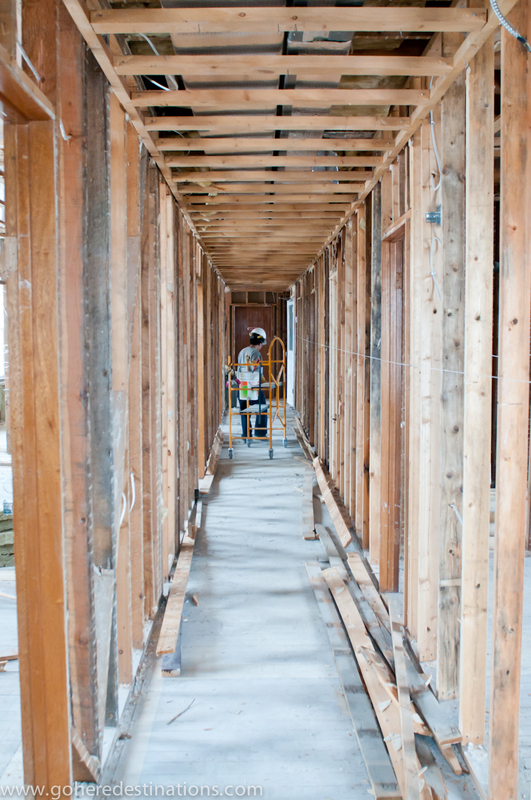 They are striving to restoring the heritage of the building while bringing the rooms up to modern standards. Many times I have driven down Pacific Avenue in Maple Creek as I headed out to Cypress Hills. Not once did I pay more than a passing glance to the historic landmark, the Commercial Hotel, bearing the beauty and scars of a growing community and the battle wounds of the booms and busts that mark the relatively short history of Saskatchewan settlement. 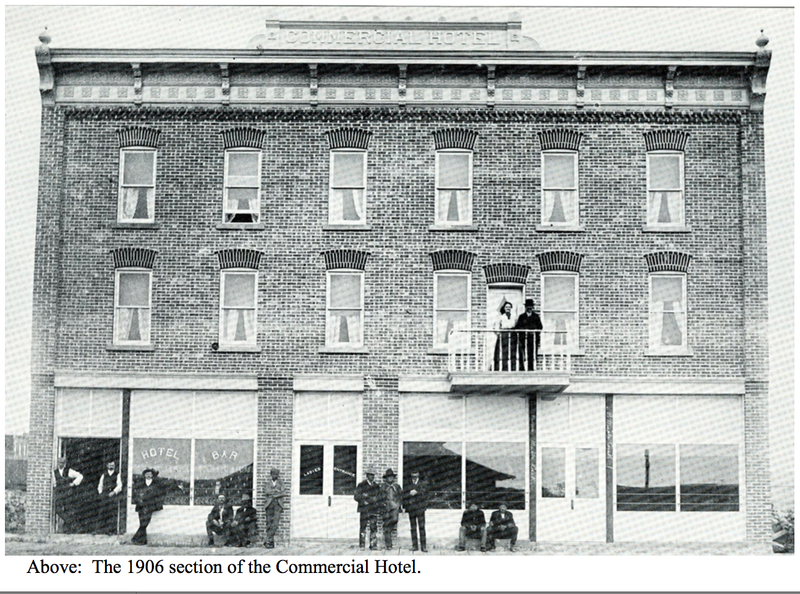 The story of the Commercial Hotel begins in 1884, and except for brief periods of closure, it has been in operation ever since. Today, March 1, 2012, from the outside, the building is tired. A hand painted sign hangs above the lobby window, a string of Christmas lights flaps in the wind, strung across the balcony sagging under the weight of the remaining heavy winter snow. The paint is peeling off the side of the building and air conditioners grip the windowsills of the third story rooms. Stepping through the doors into the lobby – most remarkable for the intact nature of its 1911 original trim, banister and tiles – you are taken back in time and into the future all within a quick scan of the room. To the left a shower door, still in a box and wrapped in plastic rests against the front window. The new box is one of many. To the right, a wide staircase with large, bulky, wooden baseboards and railings beckons a visitor to go upstairs. Once upstairs the 2nd floor is stripped and shows the skeleton of the building revealing the red brick wall that separates the 1906 addition from the newer 1911 addition. Punctuating the hollowness of the building in its current state are the sounds of saws, hammering and material carts parts being pushed through the corridor. 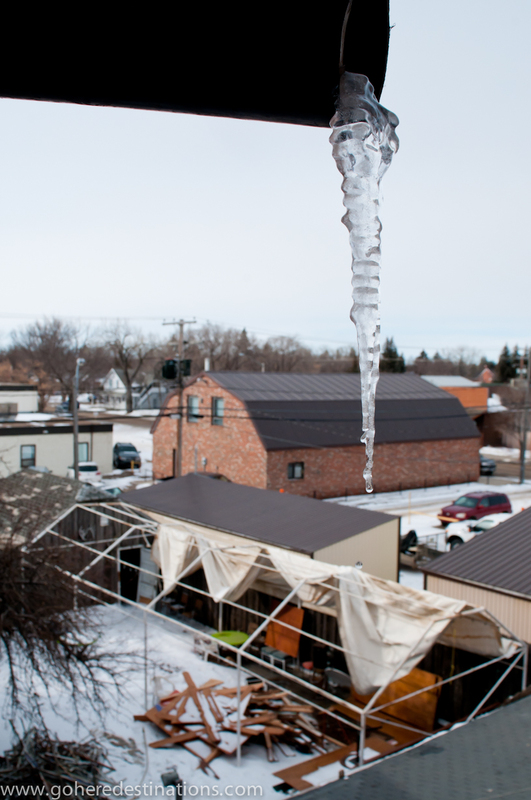 The current owners of the hotel knew they were tackling a daunting task when they purchased the aging building heavily damaged by the flood that filled many Maple Creek basements and buildings in 2010. However, they say the project is a way for them to give back to the community and help people relive and experience the heritage of Southwest Saskatchewan. 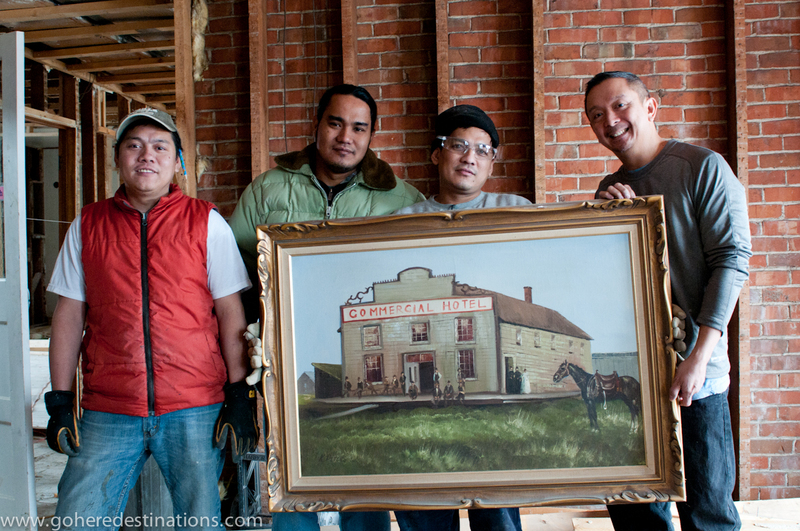 In 2012 a group of Filipino immigrants, 7 of them in total, became the newest owners of the Commercial Hotel in Maple Creek. 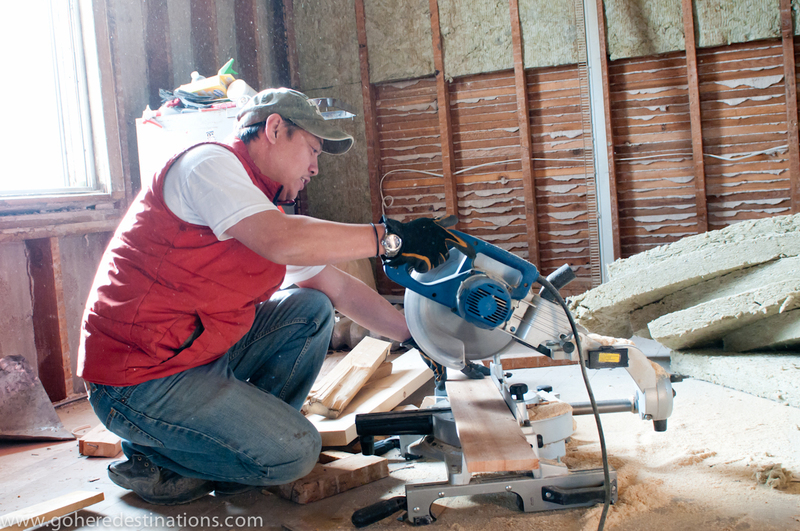 They have taken over the business and are slowly and steadily breathing life back into it. 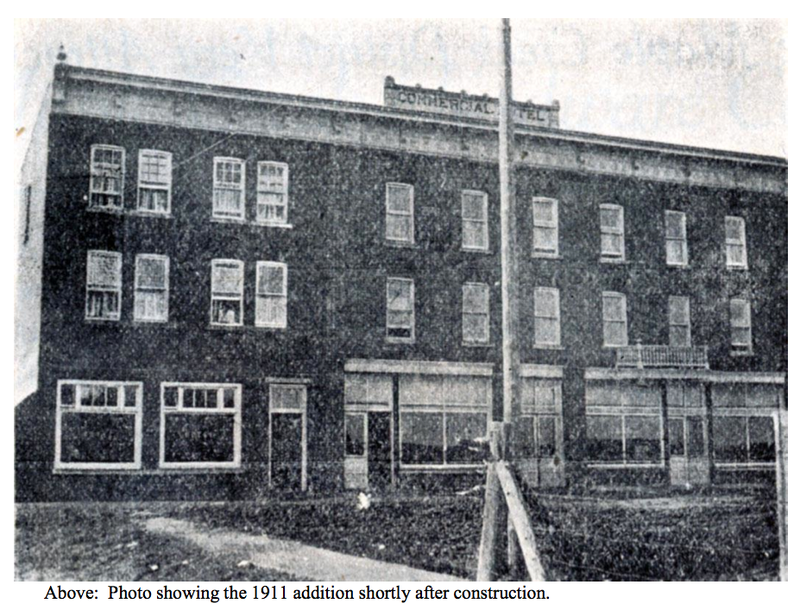 While focusing on maintaining the integrity of the buildings heritage and history they are completely redoing sections of the Century-plus building to bring it up to modern standards and to returned it to its former glory as a land mark destination in Maple Creek. 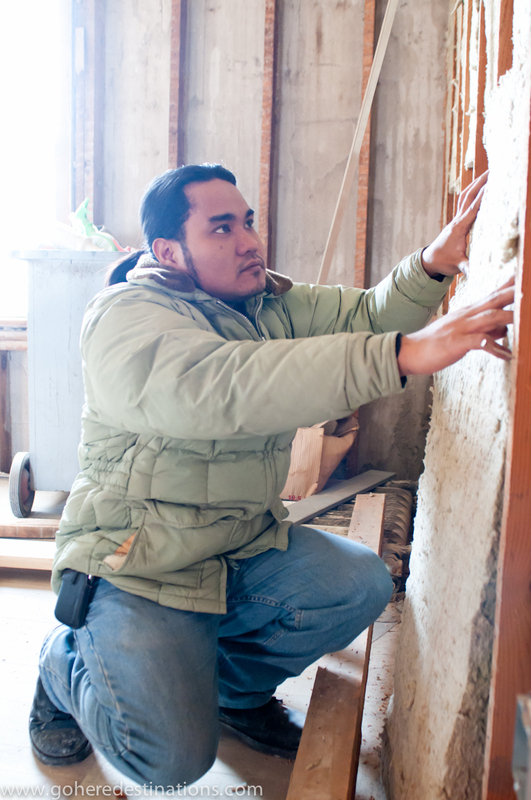 One of the owners, Jayson Catalasan, inserts installation between the rooms of the Commercial Hotel as they renovate the building to modern standards. There will be 14 newly renovated rooms on the 2nd floor of the Commercial Hotel. Out with the old, in with the new. 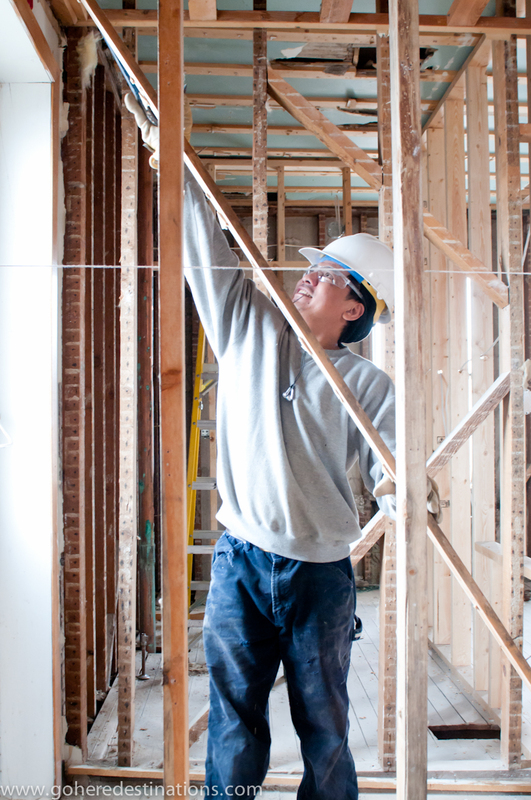 The renovation project is no small feat for the group of 7 owners. Large portions of the building has been stripped down to the frame and many of the studs have been replaced. 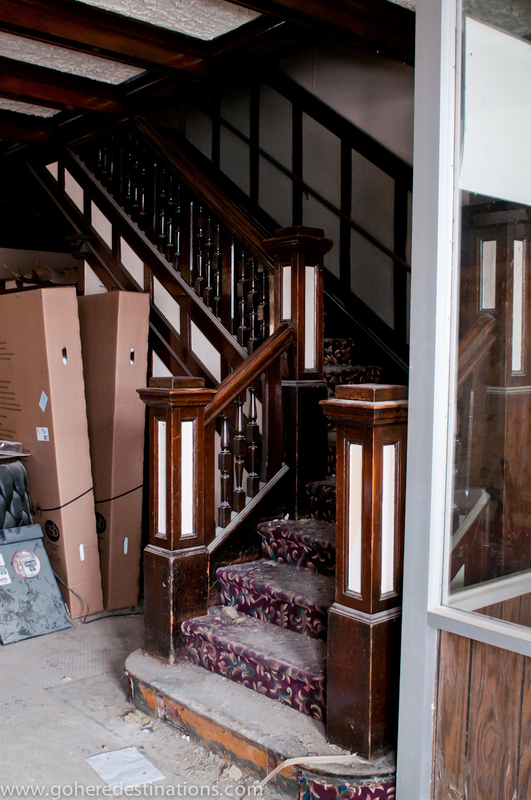 The Commercial Hotel owners are tackling most of the renovations to the Commercial Hotel themselves. Their goal is to open to visitors for the 2013 summer. One of the owners is Chef Noy, known in the Southwest for his work at the Star Cafe, another heritage building in Maple Creek that has been restored and re-opened to offer an upscale dining option within the community. When asked what the new dining room at the hotel will feature, he won’t offer any more details other then “It is a surprise!” They would reveal that the bar will maintain a country/ranch-man feel and the rooms will be bright, but warm and feature a lot of wooden decor. 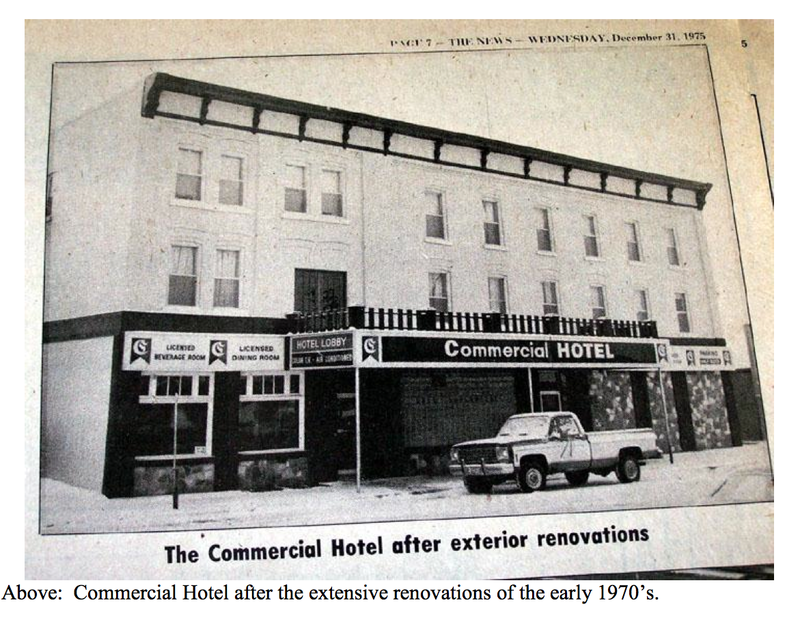 Given the hotel’s long history in the community and the proximity to Maple Creek’s original stockyards; the Commercial Hotel, has long been associated with the frontier period of the Cypress Hills, the birth of the town and Maple Creek’s ranching heritage. It is only suiting that the bar strive to keep up that connection. The patio as it is now – looking forward to patio season and checking out the new patio. The owners will be announcing the grand opening once construction is closer to completion. They would also like to make a documentary telling the “stories” of the commercial hotel and Maple Creek, to preserve the stories before they are gone. Their goal is to make the Commercial Hotel a must see destination for the travelers to the Cypress Hills Area, we at GoHere Destinations are excitedly anticipating the re-opening of the Commercial Hotel. PATIO! PATIO! PATIO! The owners have described a picturesque patio that we will be sure to visit and check-out once summer hits. The hotel was the only commercial building featured on one of the four different $5.00 coins minted to commemorate the community’s “Centennial of Incorporation” in 2003. Brand new bathrooms will be constructed to meet handicap standards. Once again this is only speculation, but we expect it will be place to go when you “Gotta go!” if you are enjoying a day shopping the niche businesses in Maple Creek, stopping in for a cup of coffee or just passing through with a promise to stay longer next time. Located in Maple Creek on Pacific Avenue just through the four-way stop if you are coming from the Trans-Canada highway. You won’t miss it. For those who’d like a map GoHere. Then you must check out the Hotel once it is re-opened. We are excited to see how the new owners maintain the heritage of the building. I am only speculating, but did the bride enter the lobby via the staircase? That would have been a breath taking entrance. Hi Leona – we completely agree. I met a tourist last summer travelling from Ontario that stopped with his Irish relatives in Maple Creek, JUST to have a drink at the Commercial. He was crushed to hear it had closed due to the flooding. So glad Chef Noy and his friends are bringing it back! (Wish I knew the email of the guy who was saddened by it’s loss – I’d cheer him up!). Great to see. So much of the “old cow town” feel has been lost to new buildings. I think the town needs to adopt a heritage theme. I live near Nelson, BC which has a heritage theme and it sure works for the tourism trade. On another note, my father worked there for his great uncle who owned the hotel somewhere around 1910 I think but not sure the date. Hi Bill! It IS great to see Maple Creek taking a more proactive approach to preserving their heritage, and their new Main Street Program will take that farther indeed! (You can read about it here: https://goheredestinations.com/2012/05/14/maple-creek-a-gateway-no-longer/ ) – That is so cool about your father and his great uncle. I’ll be sure to pass on this and other tidbits we’ve received about the hotel to it’s new owners! (Do you have any photos/memorabilia left from that time?). My grandparents owned this hotel for a time in the 1970s. I remember the old thick carpeting on the second level and the air was so dry. We would shuffle our feet and shock each other. That’s so cool Ryan! Thanks for sharing that memory. Do you still live in the area? Will you be going there for the Grand re-opening? (And trying to see if you can shock people by shuffling your feet? lol). I remember staying there sometime in the late sixties, early 70’s. my Great Uncle Louis Liepert was an owner at some time before his death in 1965. I remember that he was an avid hunter and there were many of his deer heads etc. mounted on the walls! Unfortunately in July, 2017 the Maple Creek Commercial Hotel closed their doors permanently. So sad to see it closed but the Flood of 2010 spelled it’s doom.